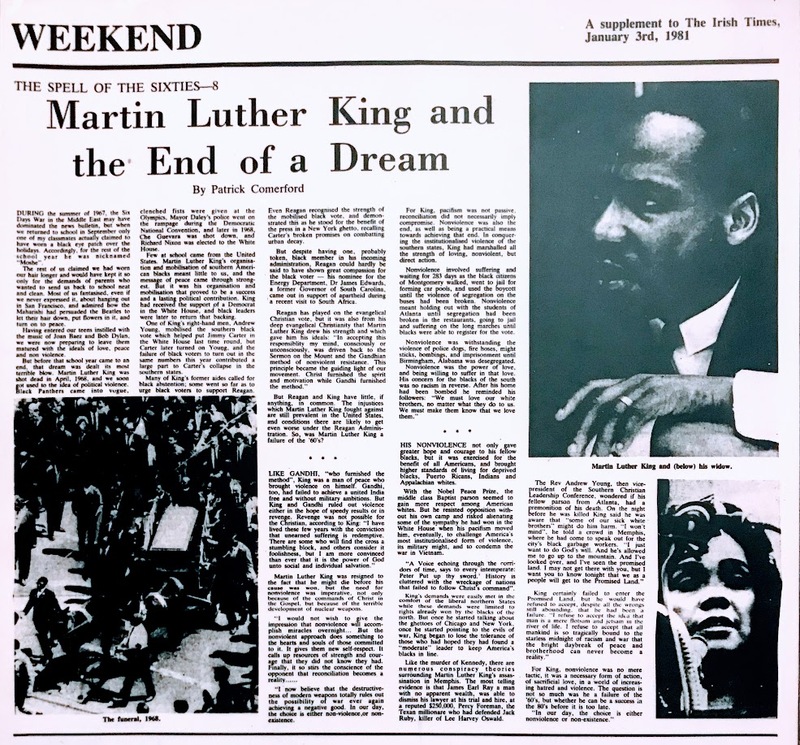 This year marks the fiftieth anniversary of the murder of Martin Luther King on 4 April 1968. Martin Luther King Jr. Day is an American federal holiday marking the birthday of Martin Luther King Jr. It is observed on the third Monday of January each year, and this year it falls on the birthday of King, who was born on 15 January 1929. During the summer of 1967, the Six Days War in the Middle East may have dominated the news bulletin, but when we returned to school in September only one of my classmates actually claimed to have worn a black eye patch over the holidays. Accordingly, for the rest of the school year he was nicknamed “Moshe”. The rest of us claimed we had worn our hair longer and would have kept it so only for the demands of parents who wanted to send us back to school neat and clean. Most of us fantasised, even if we never expressed it, about hanging out in San Francisco, and admired how the Maharishi had persuaded the Beatles to let their hair down, put flowers in it, and turn on to peace. Having entered our teens instilled with the music of Joan Baez and Bob Dylan, we were now preparing to leave them with the ideals of love, peace and non-violence. But before that school year came to an end, that dream was dealt its most terrible blow. Martin Luther King was shot dead in April 1968, and we soon got used to the idea of political violence. Black Panthers came into vogue, clenched fists were given at the Olympics, Mayor Daley’s police went on the rampage during the Democratic National Convention, Che Guevara was shot dead, and Richard Nixon was elected to the White House. Few at school came from the United States. 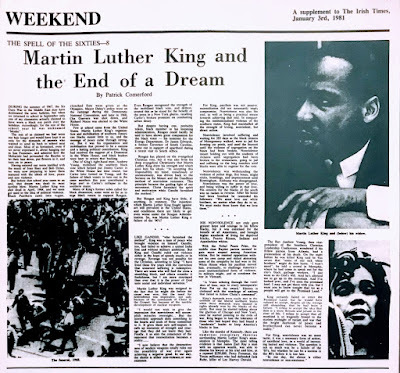 Martin Luther King’s organisation and mobilisation of southern American blacks meant little to us, and the message of peace came through strongest. But it was his organisation and mobilisation that proved to be a success and a lasting political contribution. King had received the support of a Democrat in the White House, and black leaders were later to return that backing. One of King’s right-hand men, Andrew Young, mobilised the southern black vote which helped put Jimmy Carter in the White House last time round, but Carter later turned on Young, and the failure of black voters to turn out in the same numbers this year contributed a large part to Carter’s collapse in the southern states. Many of King’s former aides called for black abstention; some went so far as to urge black voters to support Reagan. Even Reagan recognised the strength of the mobilised black vote, and demonstrated this as the benefit of the press in a New York ghetto, recalling Carter’s broken promises on combatting urban decay. But despite having one, probably token, black member in his incoming administration, Reagan could hardly be said to have shown great compassion for the black voter – his nominee for the Energy Department, Dr James Edwards, a former Governor of South Carolina, came out in support of apartheid during a recent visit to South Africa. But Reagan and King have little, if anything, in common. The injustice which Martin Luther King fought against are still prevalent in the United States, and conditions are likely to get even worse under the Reagan Administration. So, was Martin Luther King a failure of the ’60’s? Martin Luther King was resigned to the fact that he might die before his cause was won, but the need for nonviolence was imperative, not only because of the commands of Christ in the Gospel, but because of the terrible development of nuclear weapons. For King, pacifism was not passive, reconciliation did not necessarily imply compromise. Nonviolence was also the end, as well as being a practical means towards achieving that end. In conquering the institutionalised violence of the southern states, King had marshalled all the strength of loving, nonviolent, but direct action. Nonviolence involved suffering and waiting for 283 days as the black citizens of Montgomery walked, went to jail for forming car pools, and used the boycott until the violence of segregation on the buses had been broken. Nonviolence meant holding out with the students of Atlanta until segregation had been broken in the restaurants, going to jail and suffering on the long marches until blacks were able to register for the vote. Nonviolence was withstanding the violence of police dogs, fire hoses, might sticks, bombings, and imprisonment until Birmingham, Alabama, was desegregated. His nonviolence not only gave greater hope and courage to his fellow blacks, but it was exercised for the benefit of all Americans, and brought higher standards of living for deprived blacks, Puerto Ricans, Indians and Appalachian whites. With the Nobel Peace Prize, the middle class Baptist parson seemed to gain more respect among American whites. But he resisted opposition without his own camp and risked alienating some of the sympathy he had won in the White House when his pacifism moved him, eventually, to challenge America’s most institutionalised form of violence, its military might, and to condemn the Vietnam War. King’s demands were easily met in the comfort of the liberal northern states while these demands were limited to rights already won by blacks of the north. But once he started talking about the ghettoes of Chicago and New York, once he started talking about the evil of war, King began to lose the tolerance of those who had hoped they had found a “moderate” leader to keep America’s blacks in line. Like the murder of Kennedy, there are numerous conspiracy theories surrounding Martin Luther King’s assassination in Memphis. The most telling evidence is that James Earl Ray, a man with no apparent wealth, was able to dismiss his lawyer at his trial and hire, at a reputed $250,000, Percy Foreman, the Texan millionaire who had defended Jack Ruby, killer of Lee Harvey Oswald. For King, nonviolence was no mere tactic, it was a necessary form of action, of sacrificial love, in a world of increasing hatred and violence. The question is not so much was he a failure of the ’60’s, but whether he can be a success in the ’80’s before it is too late.